As a lover of Lush Cosmetics, it will come as no shock to you that I love to indulge in pretty much anything I can coming from Lush when I have a shower or a bath but baths don’t come around that often for me at the moment as having Millie means that I only really get chance to grab a quick shower in the morning or risk trying to have a bath whilst she’s sleeping which i’ve done once and didn’t really go too well. So speedy showers are now something i’ve become top notch at and having some Lush favourites in there with me ensures I make the most of those 10 minutes! It’s a shame that 2 of my favourites are limited seasonal editions, but I make the most of it and try to grab them when I can and use them sparingly to make them last (does anyone else do this!?). I should really stock up once they come in stock but I feel like hoarding 5 bottles of shower gel is a little obsessive, right!? 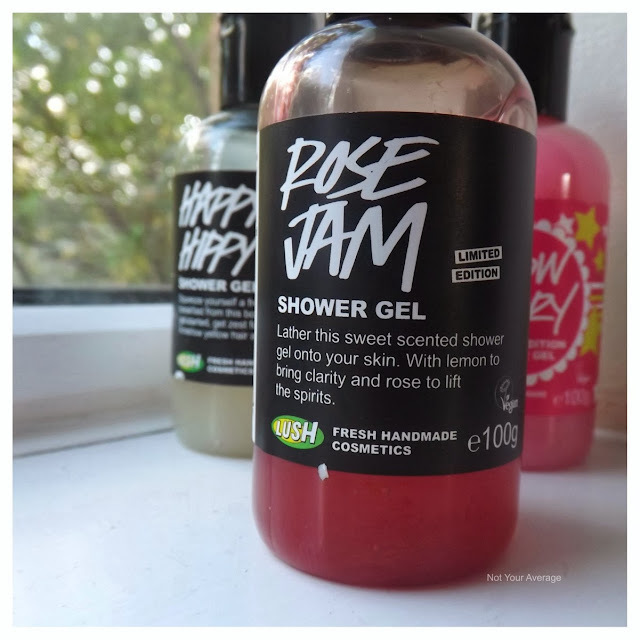 Rose Jam (£4.65 100g): So the first is one that isn’t as popular as the others but has been bought back this year by Lush due to its popular demand. I was a little iffy about buying this as I HATE the smell of Rose but when I read the description of scent, there was nothing there that seemed like it would be over powering and sounded like it would be quite a sweet smell so, I added the 100g bottle to my basket. It’s one of the more pricer shower gels but it doesn’t stop me from buying it. When lathered, it smells a little like a baked cake with fruity fragrances (so hard to describe so if you pop into store, ask to try some out on your hands) and is seriously soft and conditioning on the skin. I tend to use this after I exfoliate once a week so it softens my skin after it has taken a beating! If you enjoy scents that aren’t too powerful but sweet enough to smell once applied, i’d definitely recommend you try this. 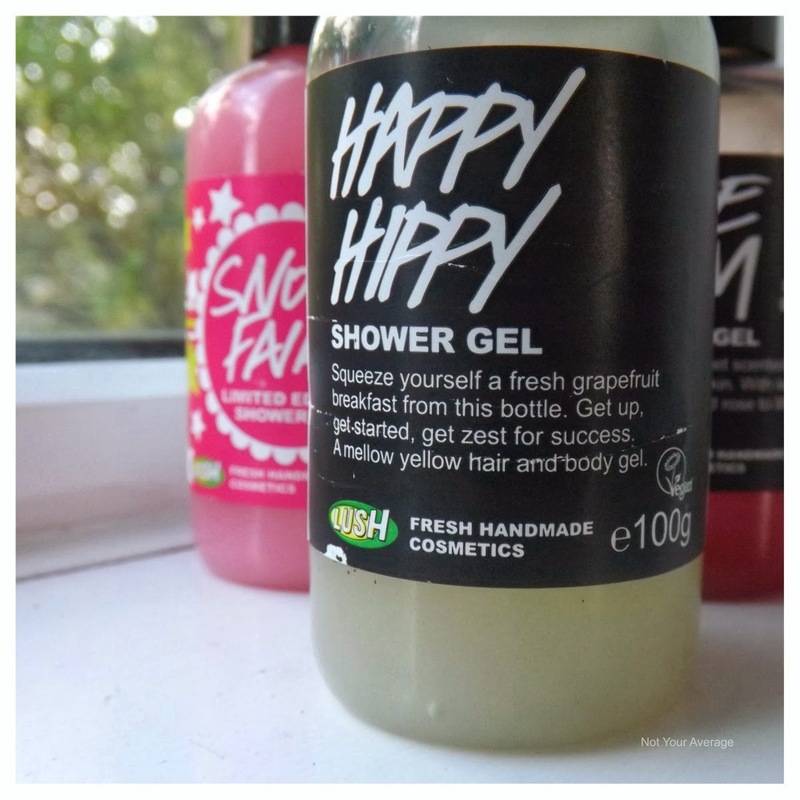 Happy Hippy (£3.50 100g): The next is probably one of the most popular shower gels to hit Lush’s shelves. Such a fresh, rich, sweet smelling fragrance that is made to help wake you up in the morning and give you that little added boost! I LOVE using this when I have an early morning shower as the smell fills the bathroom, it’s heaven! I add a little into my shampoo too because the scent stays in your hair for a good 8 hours afterwards and theres nothing like smelling clean, fresh hair all day! 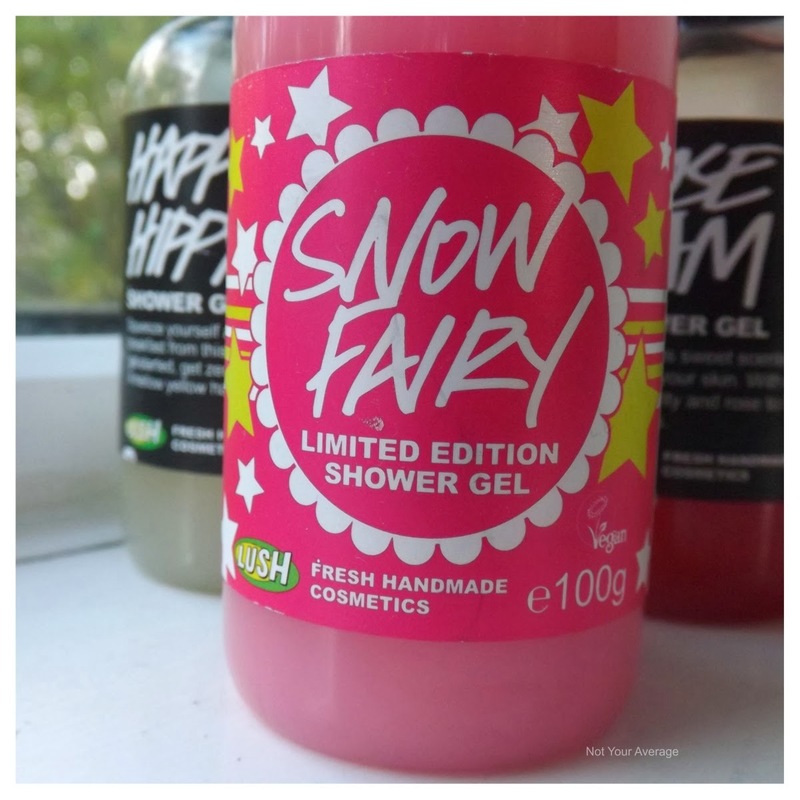 Snow Fairy (£3.50 100g): Last, but definitely not least, is the most popular shower gel of them all and unfortunately, still a seasonal limited edition. 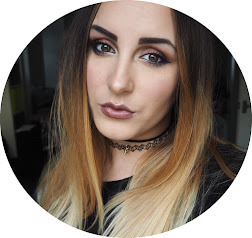 Snow Fairy has got to be one of the only products I hear people rave about as soon as Lush release their Christmas collection and when I first tried it 2 years ago, I can really understand why! I love using it but feel sad that it’s only limited edition so try to use as little as I can but I just love the scent. When i’ve had a shower, it’s like walking into a sweet shop afterwards! The smell is incredible but very sweet and I can imagine that some people wouldn’t like it! The good thing is that i’ve found the soap Rock Star is pretty similar in scent and is available all year round, yay! So, there you have it, my top 3 Shower Gels! If you feel generous when you next pop into Lush, make sure you pick me up a bottle of Snow Fairy, okay!? I NEED it in my life, all. year. long. What is your favourite shower gel from Lush!? You should stock up or wait until they have their sale! You can pick up the big bottles for like £3.50 in the sale! Definitely!! I don’t know how people can’t like it!! I really love it. 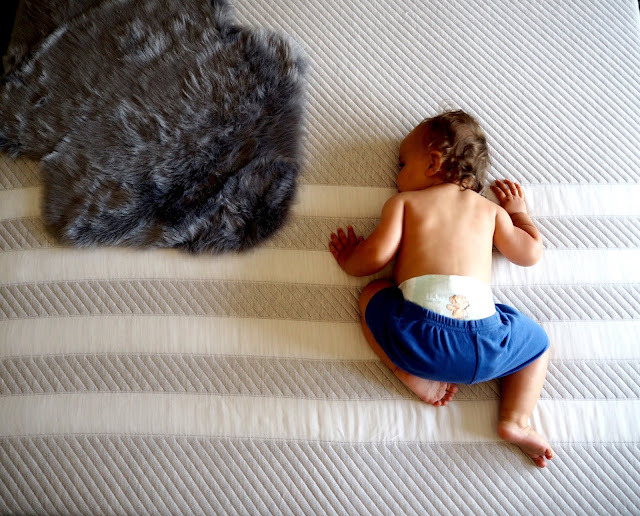 It’s not your typical popular product either! Oh you really do. I love Happy Hippy! It’s such a fresh smell! !